The Q5 is Audi's smallest entry in the SUV/crossover market. Although it would be easy to assume the Q5 is similar to the BMW X3 or Mercedes-Benz GLK, the Q5 is a larger vehicle. Under the hood, the handsomely styled Q5 equips a 3.2L V6 rated at 270-bhp paired with a six-speed automatic transmission. Audi's quattro all-wheel-drive system is standard on all models. A drive select system allows the driver to control characteristics of the active suspension, steering, transmission and engine performance. Other notable features include an optional Panorama sunroof and a Bang & Olufsen sound system. 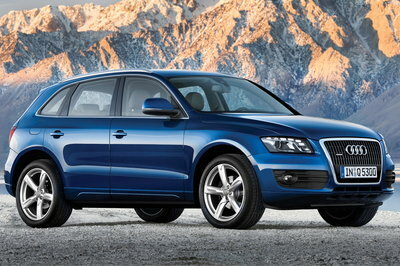 The new Audi Q5 is the first compact SUV offered by Audi. The Q5 is longer and wider than competitive models from BMW and Mercedes. Styling highlights include short front and rear overhangs, Audi's single-frame grille, 18-inch wheels, and LED tail lamps. A 3.2L V6 mated to a six-speed automatic and all-wheel-drive is standard.